This article was originally published on Saturday, 13 April 2019 at 12:16 A.M. SGT; it has since been updated to include Venture, Heeton Holdings, KSH Holdings, ST Engineering, Keppel Infrastructure Trust and Cromwell European REIT. United Industrial Corp., or UIC, said late on Friday that its indirect subsidiary S.L. 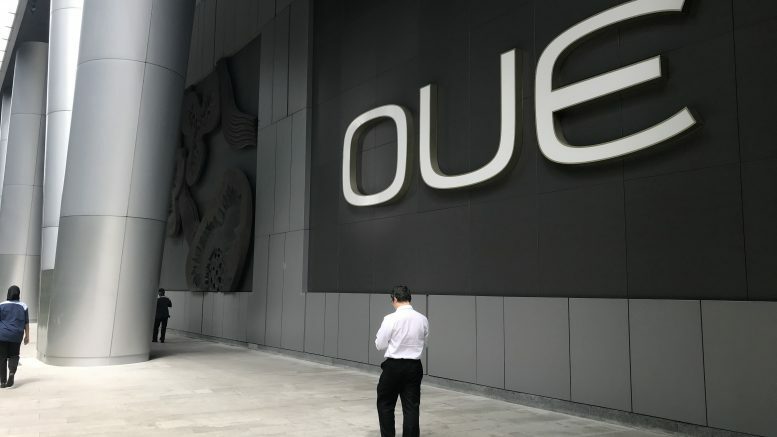 Development agreed to acquire a 24.27 percent stake in Marina Centre Holdings (MCH) from three sellers, including OUE, for a total S$485.33 million. Yangzijiang Shipbuilding said on Friday that Executive Chairman Ren Yuanlin, its largest shareholder, has contributed 150 million of his shares in the company — or a 3.8 percent stake — to a new irrevocable trust to reward senior management. Venture may be in focus after media reports that U.S. pharmacy chain Rite Aid, which has more than 2,400 stores, will stop selling e-cigarettes and vaping products. Analysts, including at Credit Suisse, KGI, CGS-CIMB and UOB KayHian, widely believe Venture is a manufacturer for Philip Morris’s IQOS smokeless tobacco device. Philip Morris describes IQOS, which hasn’t yet received approval for sale in the U.S., as a hybrid between “analog” and e-cigarettes. Keppel Infrastructure Trust said on Monday that it issued 455.31 million new preferential offering units at an issue price of S$0.441, adding they are expected to begin trading on SGX on Monday. That brought KIT’s total number of units to 4.99 billion, the trust said in a filing to SGX before the market open on Monday. Frasers Centrepoint Asset Management, the manager of Frasers Centrepoint Trust, said on Friday it appointed Richard Ng as CEO-designate, succeeding Chew Tuan Chiong, who will be retiring as CEO on 1 July. Since April, Ng has been head of asset management at Frasers Property Singapore, and from November 2013 to February 2018, he was executive director for asset management at PGIM (Singapore), the trust said in a filing to SGX after the market close on Friday. Read more about Frasers Centrepoint Trust. A consortium led by Heeton Holdings has acquired the Crowne Plaza London Kensington hotel for around 84.31 million British pounds, or around S$149.23 million, from L.C. Hotels, the consortium members said in a joint press release on Sunday. Cromwell European REIT said on Monday that Daniel Donner will resign as chief financial officer of the REIT’s manager, effective 30 April. He will be working on the transition with management, the REIT said in a filing to SGX before the market open. Donner will be shifting to Cromwell Property Group in May, the filing said. Shane Hagan, who has been the REIT manager’s head of finance since November, was appointed as the new chief financial officer, effective 1 May, the filing said. Correction: This item previously mid-identified Daniel Donner’s title; he is chief financial officer. Read more about Cromwell European REIT. China Everbright Water said on Friday that it expected its dual primary listing on the Stock Exchange of Hong Kong (SEHK) would take place on or around 8 May, subject to the exchange’s approval for the listing. The company will undertake three batches of share transfers to the Hong Kong Share Register from the Singapore Share Register for shareholders seeking an expedited process to trade their shares in Hong Kong, China Everbright Water said in a filing to SGX after the market close on Friday. But the company cautioned shareholders that there was no guarantee that SEHK would grant approval for the Hong Kong listing, and that if it did, the listing date could change or the listing might not occur. Read more about China Everbright Water. Yongnam Holdings gave notice on Friday that it has posted pre-tax losses for three straight years, while the six-month daily average market capitalization of its shares was S$91.60 million. An issuer can be placed on SGX’s watch-list if it posts three straight years of pre-tax losses and has an average daily market capitalization of less than S$40 million over the past six months, Yongnam said in a filing to SGX after the market close on Friday. Read more about Yongnam Holdings. SLB Development reported on Friday that it swung to a net loss of S$3.24 million for its fiscal third quarter from a net profit of S$2.13 million in the year-ago period as revenue declined as a key project neared completion. Civmec said on Friday its wholly owned subsidiary Civmec Construction & Engineering incorporated a subsidiary in Australia with Kellogg Brown & Root (KBR). The new subsidiary, called Brown & Root Civmec (BRC) will mainly provide integrated turnaround and maintenance service to the oil and gas sector, Civmec said in a filing to SGX after the market close on Friday. “Following a period of extensive LNG plant construction and development, the partnership is established for what the partners see as an imminent demand for contractors to provide ongoing maintenance services,” the filing said. Kingsmen Creatives said on Friday it and Chang Keat Jin injected 11.51 billion Indonesian rupiah (S$1.11 million or US$815,000) and 605.71 million rupiah, respectively, into PT Kingsmen Indonesia, based on their respective 95 percent and 5 percent stakes. The capital injection was to increase PT Kingsmen’s general working capital to expand the business, Kingsmen Creatives said in a filing to SGX after the market close on Friday. Read more about Kingsmen Creatives. Hiap Seng Engineering said on Friday that its joint venture with Malaysia Marine and Heavy Engineering (MMHE) was awarded a maintenance contract by Malaysia’s national oil company, Petronas. The contract is a five-year master service agreement for maintenance works on mechanical static equipment at all of Petronas’ plants, with an option to extend, it said in a filing to SGX after the market close on Friday. Read more about Hiap Seng Engineering.